The Zoo-Based Bondar Challenge program is developed in special partnership with each Zoo entity as a specific environment education activity explored with cameras. In a special partnership, The Roberta Bondar Foundation collaborated with Toronto Zoo’s Turtle Island Conservation to design a unique Bondar Challenge program, which took place at the Toronto Zoo’s Serengeti Bush Camp. Toronto Zoo’s Turtle Island Conservation is a special program that respectfully shares the hopes and goals of First Nation partners in commitment to the preservation of biodiversity through traditional ways. Participants experience the wildlife of the Zoo’s African Savanna and Rainforest Pavilion, while enjoying evening activities, campfire tales, and the chance to sleep under the stars in authentic African tents. The Bondar Challenge guidelines, rules, and judging panels remain the same. 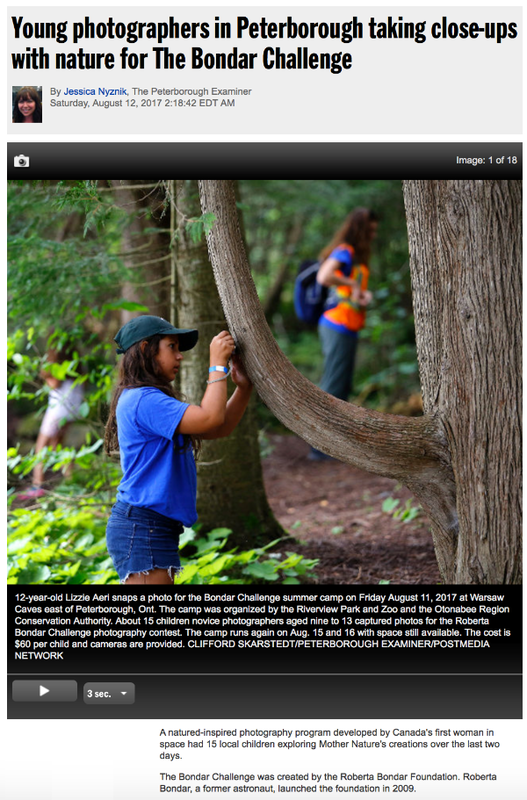 How and Why a Bondar Challenge stimulates the thoughtful “seeing” of Nature in youth, then helps them use technology to capture unique images for sharing intriguing aspects of their natural environment with others. With slide show of Clifford Skarstedt’s candid shots of these Bondar Challengers at their work in the field.